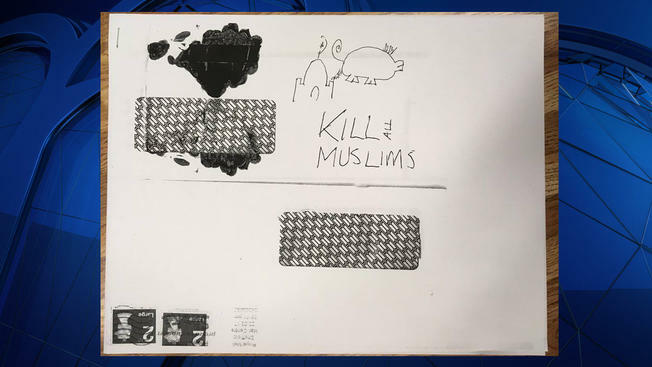 Counter-terrorism police are investigating an apparent transatlantic anti-Muslim campaign after hate mail and suspicious packages were sent from a location near Sheffield to mosques in London, South Yorkshire and the US. Handwritten notes were received by three mosques and other addresses across London in July. They all bore a Sheffield postmark, as did hate mail received by at least four US mosques earlier this year, and by three UK mosques in July last year. Pictures of the letters seen by the Guardian show many of them featured the same pseudonym or initials. Three of the letters received by US mosques were sent at the same time, with the postmarks reading 5.14pm or 5.15pm on 22 February. “There were two second-class stamps on all the letters sent to the US, which is interesting,” said Steve Rose, who is responsible for content at Faith Matters, a community action group working to counter extremism. This entry was posted in Information and tagged Counter-terror inquiry, Hate Crime, Muhbeen Hussain, Racism, tellmama by Rik. Bookmark the permalink. Good to hear that the police are investigating hate mail sent to the USA, now what about a press release saying that they have identified all those individuals sending messages of hate to the Rotherham MP, Ms Champion. Even better if they said that charges had been brought with individuals facing court. Not the wisest move to get the attention of the security services, on both sides of the Atlantic. But perhaps that was the idea?